Even though there me be no official title yet, Episode III is surely on the mind of any true Star Wars fan. While the title may still be in the shadows, there is definitely some speculation that can take place to provide a fairly accurate, if temporary, storyline. There is lots of information out there, some of which is presented below. George Lucas has said that Episode III will "be the darkest of all the movies." However, the one thing I can say for sure is that if the current progression of the "pre-trilogy" is a reliable indication of quality, the third film should easily be the best of these three. Well, after a long absence, I have finally gathered some new Episode III blurbs. Let's start things off with a Wookie roar of sorts in that Chewbacca will most definitely make an appearance in Episdoe III. Ok, so maybe that's somewhat old news to some of you, but bear with me. Secondly, Anakin WILL don the famed Darth Vader garb at some point in the movie. There is quite a bit of footage of the suit being constructed in the Creatures shop on Starwars.com. Lastly, a rather strange adversary will make his first appearance in the third film. Known as General Grevious, this character will apparently be completely CGI and be the leader of the Separatist Army. He is a droid of some sort, though it is not totally clear whether he is an androiod, or was ever human at some time. More information about Grevious will soon come to light when he appears in the Cartoon Network series, Star Wars: Clone Wars (Season 2). One more interesting piece of information I happened to run across recently is that Keira Knightley, the swashbuckling lass from Pirates of the Carribean, actually played a minor role in Episode I. She was a handmaiden for Queen Amidala; more specifically, the one who impersonated Amidala throughout some of the picture. See for yourself, and until next time, may the force be with you. Ok, although Episode III is only just being written now, there are a few plot points we can expect or hope to see. Alright, let's get the big one out of the way. The "chosen one" aka, Anakin Skywalker becomes Darth Vader. All fans are eager to see the battle between Obi-Wan and Anakin that causes Anakin to recieve his injuries. All I know right now is that it occurs over some sort of lava pit or something. After the tragic accident, Anakin is forced to wear his breathing apparatus and Darth Vader garb. Speaking of Obi-Wan, Rick McCallum (one of the producers I believe) has stated that fans will be "ecstatic" with Obi-Wan's role in Episode III. He will be escorting Padme Amidala and Leia to Alderaan and looking over Luke as a baby on Tatooine. Alderaan should also be an interesting part of Episode III. This powerful planet represented by Bail Organa during the Clone Wars may be the site of the last battle of the Clone Wars. George Lucas has rumored an exciting underwater battle may be part of Episode III, and Alderaan surely has some water on it. One thing is certain, Padme and Obi-Wan will visit this planet sometime during Episode III. Padme's future is uncertain. She is the mother of Anakin's children Luke and Leia, but will she give birth in Epsidode III? Will she die in Episode III? No one can really be sure at this point, but I think she probably dies considering she never shows up in Episode IV, but I could be wrong. In Episode VI, Leia tells Luke she remembers her mother as " very beautiful, kind,....but sad." Luke replies: "I have no memory of my mother." Thus, one can conclude that Leia and Padme probably remained on Alderaan, while Luke was taken to Tatooine with Obi-Wan. Probably, Padme Amidala will be the one who starts the Rebellion. She certainly has the reasons. One of her former most trusted friends, Senator Palpatine, betrays her in his rise to power. Her own husband becomes the most evil being the galaxy has ever seen. It would seem natural for Padme to be the one to initiate the Rebellion, but it could also be Mon Mothma or perhaps Bail Organa. Of course, for there to be the Rebellion, there must be the Empire. Hopefully we will see the full rise of Palpatine from his Supreme Chancellor position to Emperor. Will his cover as Darth Sidious be revealed? If so, one can only guess who will reveal it. While on the subject of the Dark Side, what about Dooku? Who will kill Lord Tyranus, his cover? Will the Sith hideout be discovered? With Dooku's Confederacy of Systems merge with the Republic to form the Empire? We know that the New Order must rise for Palpatine to take his place as Emperor. Supposedly, the New Order is proposed by Governor Tarkin (who we later meet as Admiral Tarkin in Episode IV) and gives Palpatine more military power than was given to him by the Military Creation Act in Episode II. Finally, the Jedi purge begins, prompted by the rise of the Dark Side of the Force. I assume the Anakin initiates it, but I'm not sure. Basically, the purge is the elimination of all Jedi. Well that's about all the organized thoughts I can pull together right now. 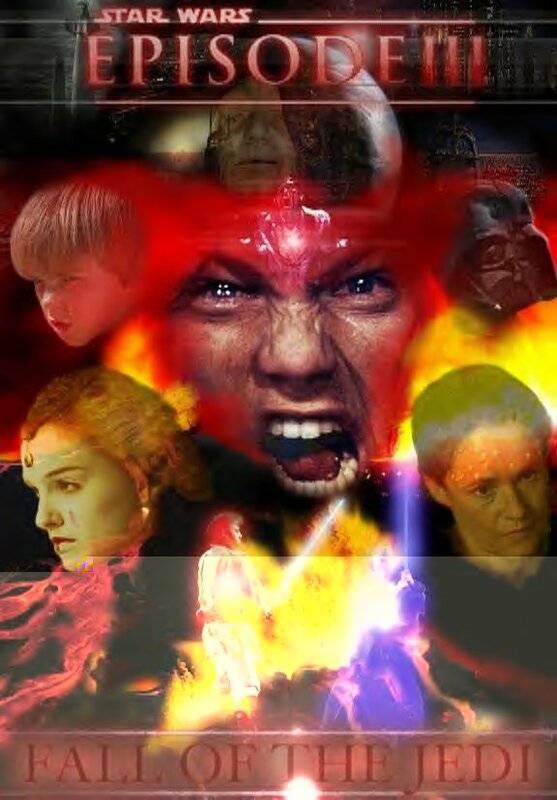 Here are a few of my own random thoughts and questions....I'm not sure why Padme is bombed at the beginning of Episode II. She was bombed by and associate of Jango Fett who knew about the clone army. Jango was hired by Tyranus (aka Dooku) and Dooku doesn't know about this clone army. He says something like "that is impossible" when the Geonosian says "the Republic has amassed a great army." However, later in the movie, Sidious is pleased that "the war has begun." I guess they would have wanted to bomb Padme since she was coming to vote against the creation of the Army of the Republic which would stop Palpatine from getting all his military power. Perhaps Dooku knew all along about the clones, as Palpatine wanted to steal them for his own purpose, but he was just acting out his part for the Genosian. Anyway, had to get that off my mind, I know Episode III will clear everything up and I can't wait till it comes out in May of 2005!! !